Tom survived a devastating flood that claimed the lives of her sister and parents. Now she lives with Bill in his old shed by the lake. But it’s time to move out, Tom is pregnant with Bill's baby. Jonah lets her move in with him. Mrs Peck gives her the Fishmaster Super Series tackle box. Nana is full of gentle good advice and useful sayings. Fourteen year old Tom has is lost. Her family was swept away in a flood that devastated the tiny town of Jessops Creek. With her only living relative, her grandmother in the Mavis Ornstein Home for the Elderly, Tom had no option than to live in the old shed with Bill, who assumed she had been a boy. Bill is incredibly secretive, he fools around with a married woman and when he discovers that Tom is only a nickname and she is in fact a girl, Tom finds herself pregnant and homeless. Until best friend Jonah takes her in. Tom may have lost everything, but she's never alone. Her grandfather who passed before she was born, resides at her grandmother's nursing home, offering advice and keeping watch over the woman he devoted his life to. She feels her mother's presence, although she cannot see her, but she's almost certain her younger sister Sarah is the little Catfish that often keeps her company while she fishes at the local inlet. As The Minnow grows inside her, Tom's life becomes more complicated. Bill still wants to go fishing, new teacher James Wo convinces her to further her studies, her grandmother is being courted again... And then the police come knocking. It all becomes too much for Tom. Fifteen, pregnant and searching for closure. 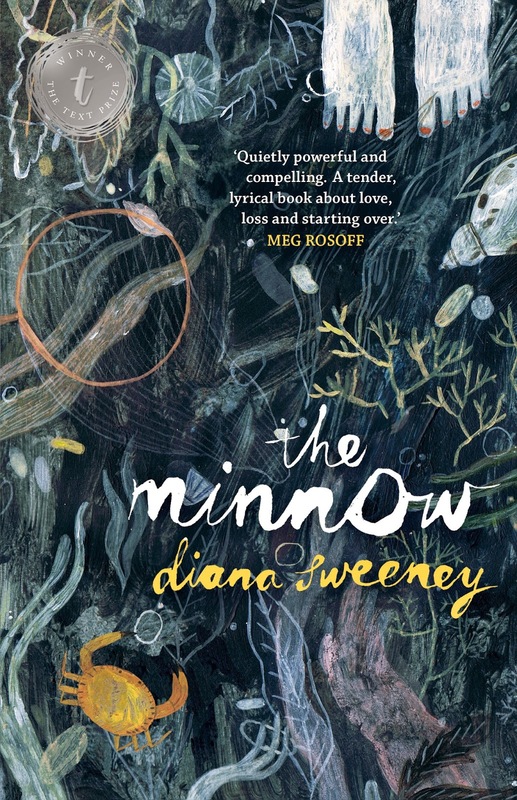 The Minnow is a story of grief, loss and one young girl learning to heal. Tom, who's nickname is all she's known by, is an incredible character. Although her short life so far has been ravaged by incredible sadness, she lives with a fairytale type, whimsical outlook. She talks to the spirit of those around her who have passed, she speaks with fish in the pet shop and inlet, and of course The Minnow, which is what she's decided to call her unborn child. I'm sure it's not uncommon for those experiencing such sadness, to talk to the deceased, but Tom often describes their conversations and being able to physically touch the dead. I felt incredibly sad for Tom and her unborn child, although she now lives with her best friend Jonah, who is a huge support, she's a young girl without her mother who is potentially facing life as a single parent at only fifteen years old. Throughout The Minnow, Tom shares her love of words plucked from her dictionary. It was incredibly endearing. But as much as I loved Tom's character, the storyline left me confused at times. I needed to reread passages to find a hidden meaning to unravel the story, constantly feeling as though I was missing something. It jumped from what was the present, to Tom recalling incidents that I wasn't sure had happened, or like talking to the dead, were a figment of her imagination. I have a theory on what the storyline was alluding to, but sadly it's never quite confirmed.My only main gripe was that so many in town knew who fathered The Minnow, but so many adults had let her down. So how do you review a book that you didn't quite understand? Easy. It was beautiful, and a worthy winner of the Text Prize. I'm going with the premise that we're never quite meant to understand, and that's what the wonder of The Minnow is. It's supposed to provoke thought and for the reader to draw their on conclusions, It was simply lovely. It allows the reader to see the beauty of our world though the eyes of a girl who has a second chance, and a new life to live for. And it goes without saying, that cover is simply divine. This looks like a really emotional book. I think books or stories that make you work everything out or draw conclusions for yourself can definitely be confusing and sometimes hard to get into. But I'm glad you still appreciated this one. It was Francine, but I think it was intended to allow readers to draw their own conclusions, That was my take on it at least. It's really emotional, but by the end, I felt such a sense of attachment to Tom. She's such a precious character. I don't understand why Tom was living with a strange man in a shed instead of with Jonah's family from the beginning… the whole situation just sounds so heartbreaking. I can understand how it became confusing with her talking to so many different spirits and including flashbacks. I was planning on reading this one but I really don't like open endings left to interpretation so I may cross if of my list. Without giving anything away. Jonah didn't have a family as such, and he's only sixteen. He moved into his own place and Tom moved in there eventually. Tom living with Bill was heartbreaking. I was hoping somewhere along the way that someone would take him out. It's certainly worth it Sunny. You can't help but fall in love with Tom. She's just so innocent and seeing the world through her eyes was truly heartbreaking at times. I do get what you mean! I was confused. I didn't even THINK about your theory (that you said on Goodreads) until you said it, and then I had an "omg, that probably was it" moment. x) So yes. Hehe. I will not be winning any genius awards after reading this. BUT. It was very beautiful and lyrical and I just felt very calm reading it. The minnow was soooo cute. N'awww. I was confused too, so I wonder if that was the intention. At the start, Tom's circumstances left me really angry and helpless, but as Tom moved forward, it was that strange sense of calmness, so weird. Was it all the water references? I'm looking forward to seeing more readers pick this one up, to see what they make out of the ending. Sounds really lovely and beautiful, I love thought provoking books like this. I'm glad you mentioned that you found it confusing and had to re-read passages at times, regardless. Thanks for sharing! It's confusingly beautiful. Even thought the storyline felt strange, like stuck between being awake and dream like, Tom is undoubtedly the star. I just wanted to wrap her in bubble wrap and protect her. It sounds simple, but it'll keep you on your feet. Can't wait to see what you think of it Jeann. I can’t wait to read this now Kelly! I love books that make you question everything and wonder what the heck is happening. One thing I really want to know is why Tom was with Billy because that just sounds super weird. Great review Kelly! I’m looking forward to this even more now. It was, but when you take the big picture into account it makes sense, but was still totally wrong. I can't wait until you get around it reading it Katie, besides Cait, we need more readers to talk about it with, without spoiling it for everyone else. It's so beautiful and whimsical Jules, I think you'll really enjoy this one. That's it. I am moving to Australia just so I'll have access to all these wonderful books you Aussie's keep on talking about. This one sounds so heartbreaking but at the same time so wonderful! Thanks Rashika, we're all looking forward to your migration. I'm already making my poster as we speak. It's heartbreaking, confusing, so incredibly poetic, confusing, artistic and did I mention confusing? But it's beautiful, there's just no other word to describe it. It really is a hard one to review too, on the one hand the storyline throws you a few surprises, but it's also really hard to interpret what they actually mean. We have a running discussion in our Aussie YA group at the moment how others have interpreted the book. I'm thinking we should probably ask the author. It'll certainly make you think Zoe, I was just a jumble of emotions and found myself going through stages strangely. Anger, then grief almost, sadness, joy, confusion. It really was a roller coaster. Can't wait to see what you think of it Zoe. Thanks for sharing your fantastic review, Kelly! I haven't heard a lot about this book, but the two reviews that I have now read have definitely intrigued me! I may be wrong, but after reading yours and Emily's review, I'm getting the feeling that this book has an On the Jellicoe Road-esque vibe about it. And, as you know, I absolutely love that book, so now I'm definitely going to have to check this out. It's actually a really strange read that seems to depend on how we each interpret it. I think you'll really enjoy this Ebony, it's quite an intelligent and emotional.